This National School Counselors Week (Feb. 4 - Feb. 8), Arcadia Unified School District celebrates its 23 school counselors, 11 of whom were hired or made full-time this school year in support of the district’s emphasis on bolstering social and emotional support for its students. There is now a full-time counselor at each of the district’s elementary and middle schools, ten counselors at Arcadia High School, and two transitional counselors. 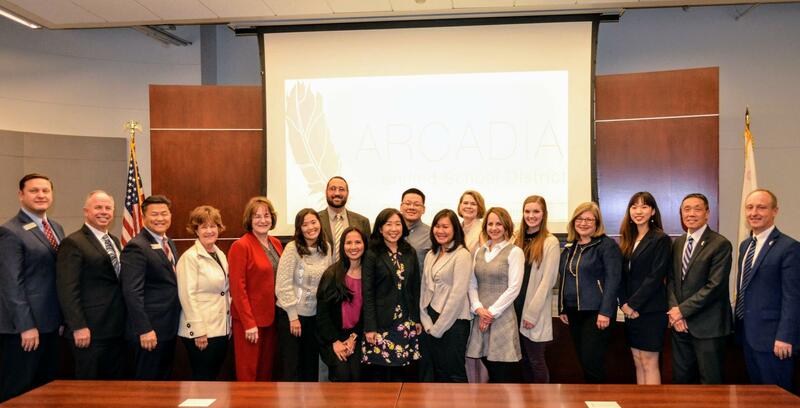 Though not required by a local, state, or federal mandate, to further effectuate this board commitment, Arcadia Unified’s Board of Education approved the hiring of full-time school counselors for each of its six elementary schools. Prior to the 2018-19 school year, there were three school counselors allocated to the elementary schools who split time between each site. Having worked as a school counselor during his career, Arcadia Unified Superintendent Dr. David Vannasdall has a special understanding of the important role school counselors play in the lives of students. Walk on any of Arcadia Unified’s elementary and middle school campuses, and you will see signage and banners related to Stephen Covey’s Leader in Me program, a program that instills positive leadership and life skill habits, some tenets of which include “be proactive”, “begin with the end in mind”, and “seek first to understand, then to be understood.” This program and many others, such as Second Step, a social-emotional learning program that is geared towards building a sense of safety and respect starting in kindergarten, are just a couple of the important programs being implemented with consistency and effectiveness as a direct result of the district’s school counselors, explained Dr. Vannasdall. For the past two years, Arcadia Unified has been ranked as the best place to teach according to Niche.com, which seems to have helped with garnering top-notch applicants for the newly added school counselor positions. “Many of our counselors are also MFT’s [Marriage and Family Therapists], which has helped build parent and family connectedness with each of our schools,” said Dr. Vannasdall. Some of these school counselor-hosted events include Parent Education Nights, with topics that range from “The Art of Communicating with your Child” to strategies to promote digital citizenship, and participation in the nonprofit Kids for Peace’s “Great Kindness Challenge,” which is a week’s worth of promoting acts of kindness at school, at home, and in the community. Likewise, Arcadia High School’s counselors host Mental Health and Wellness weeks, where words of kindness and support can be found in bright chalk colors throughout campus grounds and yoga, meditation, and mindfulness activities are promoted. To further demonstrate the importance of school counselors, Arcadia Unified’s Board of Education recently passed Resolution No. 1377, officially adopting and declaring the week of Feb. 4 through 8 as National School Counseling Week to both recognize and honor the important contribution school counselors make to ensuring support for students beyond the books. Dodgers Visit Camino Grove Elementary School! Arcadia High Football Advances to CIF Championship Game! First Avenue Middle School’s Student-Actors are Out of this World! Arcadia High Constitution Team Scores Big in Washington D.C.
Arcadia Innovation Summit June 24! Schools See Nearly $10 Million in Summer Upgrades! AUSD Middle Schools Rank Highest on API in LA County! Arcadia High Student Earns Rare Perfect Score on AP Exam! Arcadia Unified Expanding AVID Program!